thanks Ginette, I must apologize: I watch this forum as well as the ravelry one and never thought of viewing the contents below each video. Sorry sorry sorry. Don’t see why not. 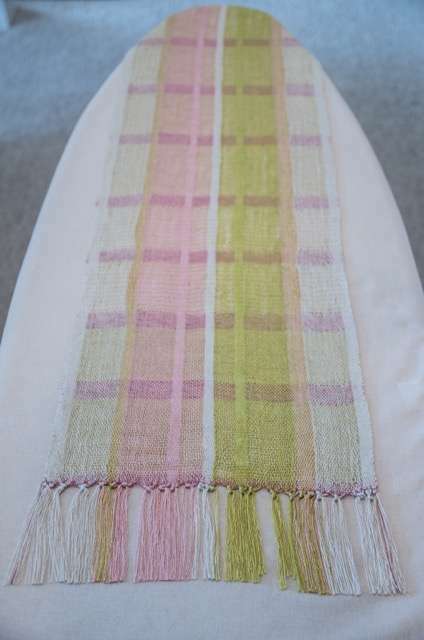 Under episode 3.2.1, in the comments, Sue mentions that she wove this linen sample on the Jane loom and the ‘linen behaved like a dream’. Hi! 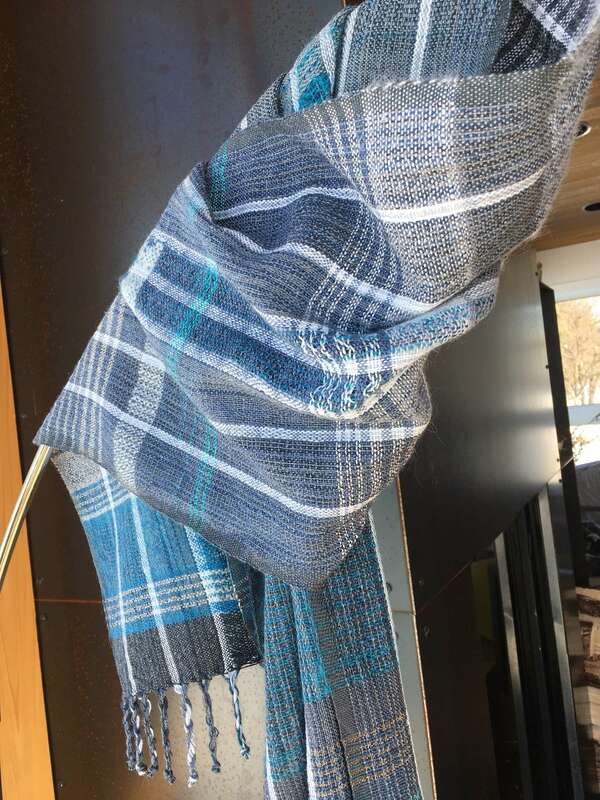 How about the Jane loom from Louet for this exercise with linen (the only one I use)? I cannot remember Jane mentioning it in the video. Thanks. I so admire the work of my fellow participants. it’s just beautiful! thank you for sharing. Jane, thank you for teaching cramming and denting. I had no idea these techniques existed. I’m enjoying expanding my horizons through taking your class. re: use of linen on a Jack loom. 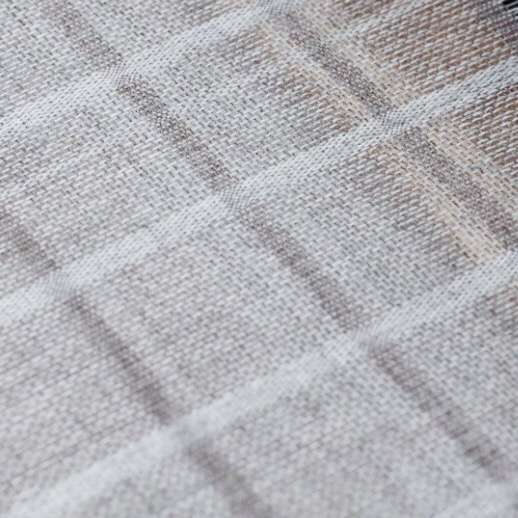 I’ve had a lifelong love affair w/linen so love learning more about how to weave with it. 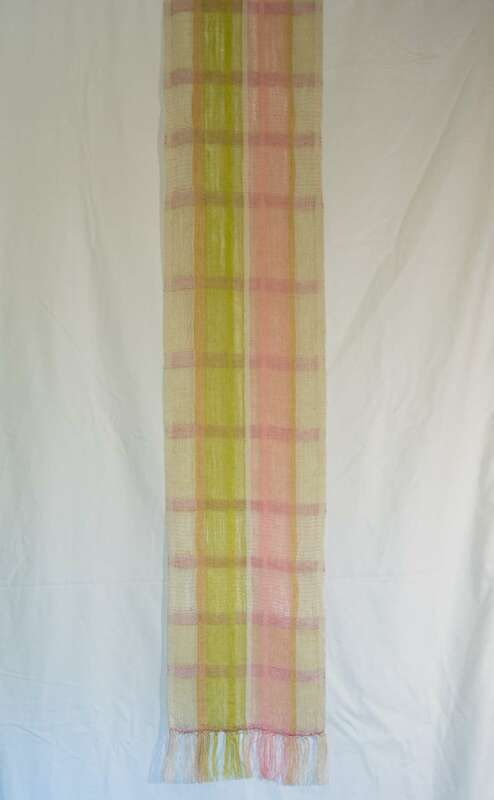 I have Schacht looms and have woven w/linen several times without breaking any threads. I haven’t dampened the linen, I just watch it pretty carefully trying to catch knots or anything else that might hang it up. on this piece I did advance the warp quite hard and I did beat quite hard as well. nothing went wrong other than slight slippage in tension on back beam. 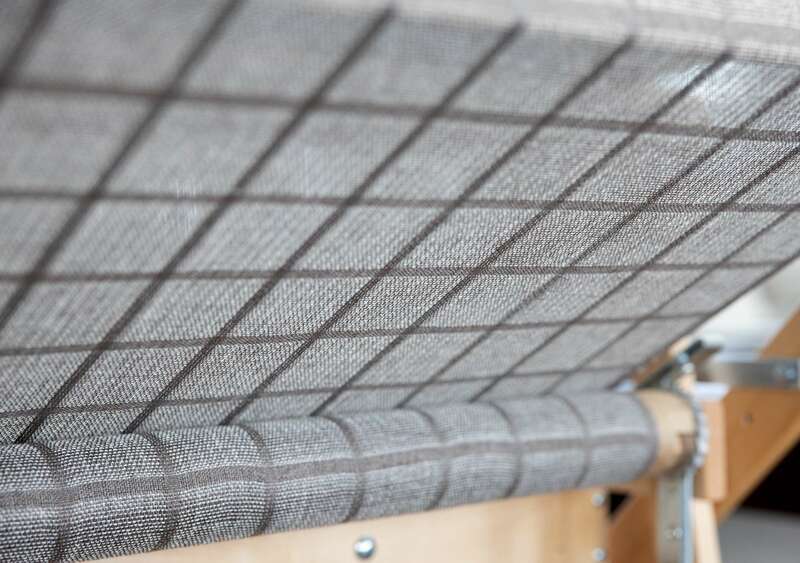 On this ‘cramming and denting’ piece I used 20/2 linen for warp and 20/1 linen for weft. I used fewer colors but am happy with the results. 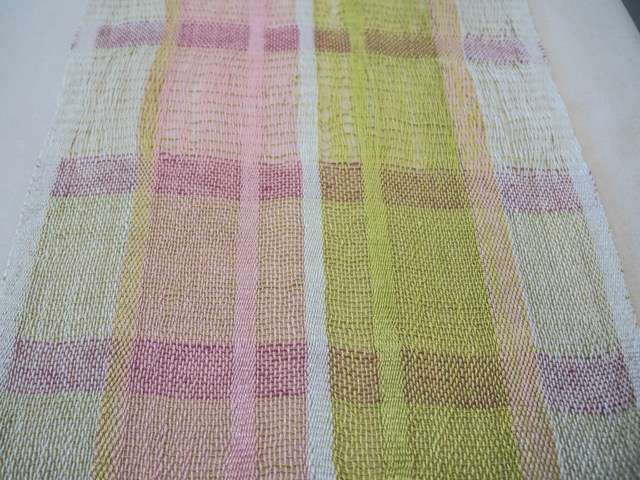 colors are natural, pink and chartreuse for warp and dark pink and chartreuse for weft. I intend to use this piece as a runner for the sideboard in our dining room. Hi Mary – I just entered “linen on a Jack loom” into the Forum’s Search function and several comments and discussions came up. Also, another useful tool that Jane has provided for us is the Helpline. You can find it from the main page going through the Information tab. Jane’s comment about linen and Jack looms can also be found there. Don’t worry, you’ll have years of pleasure with your new loom! Hi all! I see that one person above has had success weaving with linen on a jack loom. I remember from one of the season one videos that linen weaves better on a countermarch loom. Has anyone else been successful using a jack loom with linen? Any other tips? I have read that some people dampen the warp. I wish I had known this before I purchased my loom! I am a bit nervous to try this. I am so enjoying Jane’s online courses. Here are my cramming and denting experiments on the loom. The first is Jane’s cashmere for warp and yak/silk as weft. The second is the flip. I decided to put a second warp on my loom based on the crammed and dented. This time I used a variety of fibres some recycled denim lace weight, 8/2 tencel, mohair/silk, 8/2 cotton, and zephyr wool/silk blend. I did a fairly random warping and sleyed the edges and white threads crammed. I had other areas sleyed at 18 and 16 epi and the center sections at 12 epi (mohair was one per dent). I wove with a variety of fibres emptying bobbins that I had laying around. Loved this project and the drape of the fabric. Thanks for the inspiration. 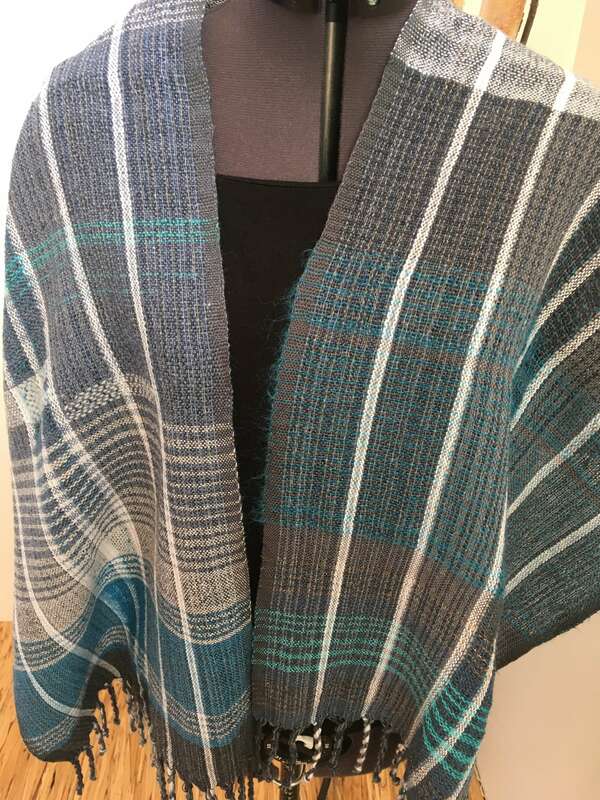 and wove plain weave, with a narrow band that I wove empty (? English? ) at 2/3rds. The narrow empty band disappeared, with mohair traveling after washing. No graphic interest. The contrast between vertical dense areas and very open areas is clear and nice. The empty area on right side is too small to show anything. Drape is better than last one. This reply was modified 1 month, 2 weeks ago by taty.lauwers. I like your idea of adding empty dents between the crammed & opened areas and changing your setts. That might just help to define each section a bit more. The rosepath pattern is really beautiful in your samples and how it gives texture! Did you get a chance to give it a gentle brushing? and thanks Jane for a very nice video. I have done a very small first sample for cramming and denting. First pictures and first question below. Warp mohair handspun singles yarn is 15wpi (6t/cm). * 20 epi (8f/cm) i.e. 2 per dent for my 0,8 inch (2cm) crammed areas. Warp is my standard rosepath one (I attach new stuff to the old one). 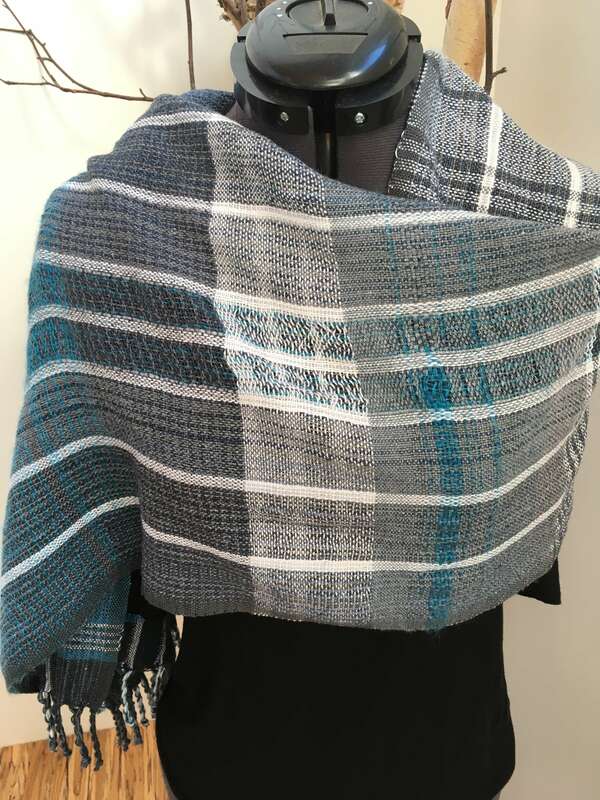 I have used mainly 1234 but I tried some plain weave too. I did not aim for squares. 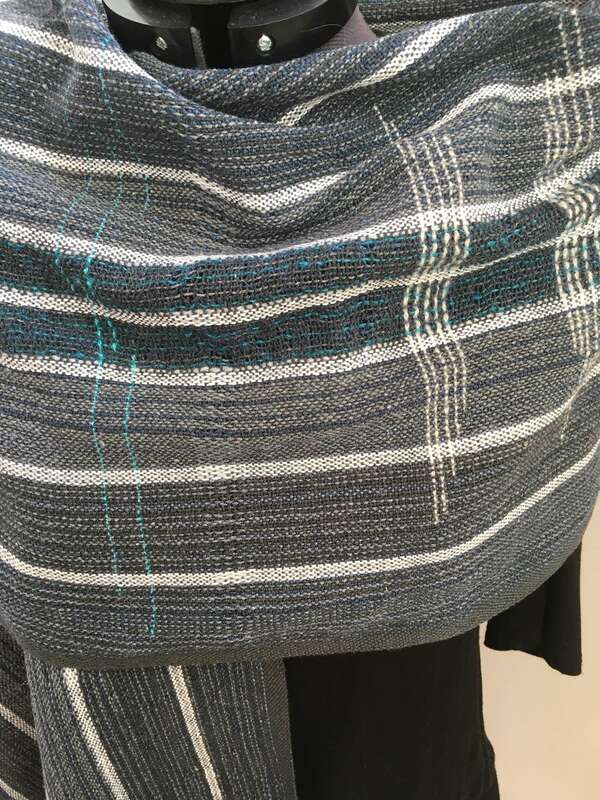 I like the overall effect of a pseudo lace, I like the texture of “stitches”, but even the very open area on the right has mish-mashed with crammed area : we cannot see a clear definition as in your scarves. Whereas such a very open one I expected to show up contrast with crammed area. Since it is wool, I can understand I think how it moves. I will have to resley the rest of the warp with 20 epi for all crammed areas and 5 epi for open areas. (I still have 4″ of warp free). I am thinking of leaving one or two free dents between each transition, i.e. between crammed and open areas, so that I can get a clear definition. Or maybe I was totally absent minded and did not follow the instructions. Can happen! This reply was modified 1 month, 3 weeks ago by taty.lauwers. thanks Ginette, but then why not write the usual “11 ppi” or “13 ppi”? anything special there? Great news, Ruth and great advice from your learned and shared experience! 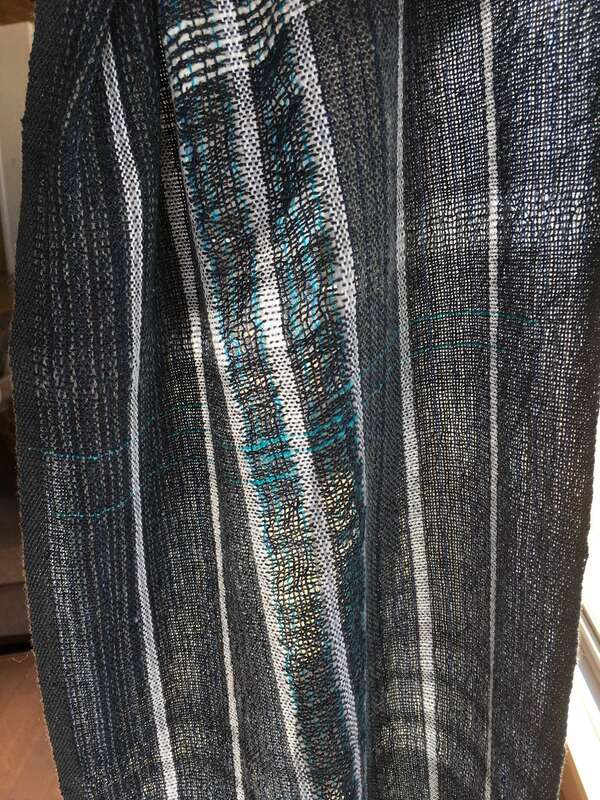 I am happy to report I successfully managed to weave with linen on my 1974 leclerc jack loom!! It was a bit tricky and after breaking 4 different warp threads through my trial and errors I would offer the following suggestions to anyone else: don’t torque down your warp but rather keep it on the loose side. This requires a little more attention when throwing the shuttle but its easier than fixing a broken thread! Also be very careful not to “misthrow” the shuttle as the jamming can cause breaking. I also cut off and retied my warp between each piece. It just worked better than weighting with a rod. The end product was well worth it!